Eat 3 to 4 almonds daily for better health results. Soak Almond in water overnight and eat in the morning. 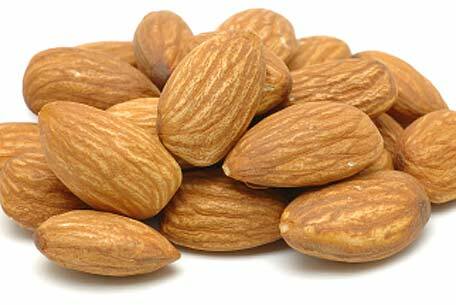 You can eat almonds directly, prefer to eat it empty stomach for the absorption of their nutrients. Almonds are a tasty and nutritious snack with plenty of health benefits. Almonds are loaded with vitamin E, monounsaturated fat, magnesium, phosphorous, calcium, zinc, folic acids and fiber. Those nutrients helps in preventing heart disease, high blood pressure, some cancers, and osteoporosis. There are two varieties of almonds, sweet and bitter. Sweet almonds can be eaten raw or added to. Almond oil is extracted from bitter almond. Massage with Almond oil keep your skin smooth and silky. Unsaturated fats present in almonds helps you to keep weight loss . Soaking Almonds also decreases phytic acid present in almonds which prevents easy absorption of iron, magnesium and Zinc. One of the best effects of eating almonds is to sharpen the memory. You can prepare a mixture of almond oil, honey, and lemon juice, and apply this as a face pack once a week for smooth and glowing skin.